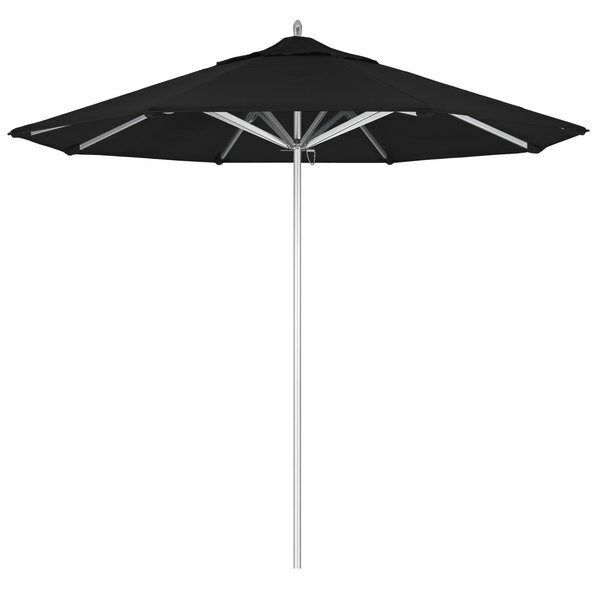 Keep your decks, outdoor dining areas, or pool-side patios shaded with this California Umbrella AAT 908 SUNBRELLA 1A Rodeo 9' round push lift umbrella with 1 1/2" aluminum pole. Inspired by the luxurious styling of boutiques and eateries along California's Rodeo Drive, the Rodeo line offers umbrellas with poised and refined elements. This umbrella features a 1 1/2" thick aluminum pole with sleek, stainless steel hardware for a robust foundation. Its durable aluminum ribs provide excellent support for the canopy and are specially constructed to resist bending or buckling under stress. In addition, the single wind vent allows for sufficient air flow to ensure stability and prevent the umbrella from moving with strong wind gusts. The canopy's Sunbrella 1A fabric is made of 100% solution-dyed acrylic canvas and is fade resistant under prolonged sun exposure, ensuring for a colorfast final product. It will provide a professional look for years to come. Height (to bottom of ribs): 82 5/8"